This week’s task was a little something for a local company I do a bit of work for, Earthly Goods. 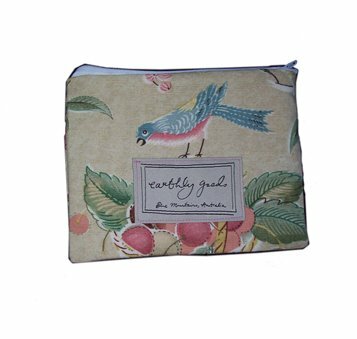 Earthly Goods creates bespoke quilts and homewares for customers, with a sustainable ethos, using recycled and vintage fabrics, hemp and organic cotton wadding. Many people may have a stash of special fabrics or embroidered linens, without really having a way to make use of them. So the idea behind Earthly Goods is to take these precious fabrics and showcase them on a quilt or some such so they can be enjoyed in daily life. No project is too big, or too small, as can be seen by this little makeup case I whipped up for an Earthly Goods client.